If you are among the millions of Americans dreading the next few days until April 15th, you are not alone. Tax season is upon us and as every form of media conspires to remind you of the significance of Wednesday, whether you do your own taxes or not, you are likely feeling some pressure. In this midst of this 1099-imposed national rise in stress, TurboTax (a leading self-service software solution to do your own taxes) is finding their authenticity through social media and helping to reduce (if not to remove) the stress involved in these last few days of taxes. Understanding the urge to procrastinate. Let's face it, social media tools and sites offer just about the best distraction you can think of to avoid doing your taxes. 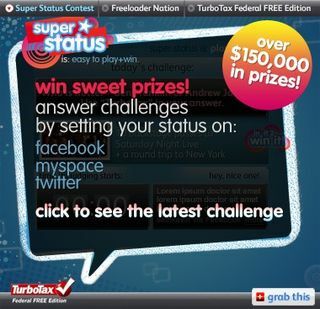 Rather than offering a guilt trip on why we need to refocus on our taxes, TurboTax has a contest called the "Super Status Challenge" so you can waste time on your social media sites answering challenge questions (where your answer needs to include the word TurboTax), while still remaining somewhat connected to your taxes. And instead of offering relatively useless prizes, like free product … they have a smart partnership with NBC to let people win dream trips to meet casts and crews of some of the most popular shows on the network. The whole campaign is like putting a sandbox in the classroom. We play a little, and (hopefully) get back to work. Talking like a human. From the first moment you log into TurboTax and are asked to agree to a legal message because their "lawyers made them do it," you don't have the sense that you're entering into a serious financial transaction. You are about to give TurboTax what may be the most sensitive financial data you own, and they are not weighed down with the perceived need to take you through thousands of words of legal disclaimers. This dedication to using natural language instead of legal mumbo-jumbo is carried through the entire site, which makes you thankful they seem to have hired copywriters in place of lawyers to write the content on each page of the site. Offering you a friend at a tough time. For many people, tax season seems like a time when the government is out to get you. It is the ultimate of an "us versus them" kind of situation, though arguably it should not be. At a time like this, you need a friend in the business, and that's what TurboTax wants to be. The site will offer helpful suggestions, guide you through every deduction and help you keep more of that money you worked so hard for. Allowing people to share the lesson they just learned. Doing your taxes every year is a bit like a treasure hunt. You learn new tricks, techniques and answers every year. As you do it, you get smarter about what is possible – and sometimes you can apply those lessons to next year. The other benefit of this, however, is that there is always going to be someone who has just learned the lesson you need to learn, or has the perfect answer to your question. Rather than assuming their own staff will have all the answers, as many customer service teams try to do, TurboTax has a robust community that lets anyone answer anyone else's question. Combined with many of their own moderators, it is a powerful way offer a support group for people as they do their taxes. Answering the unanswerable questions (in a way that actually makes sense). Pages of frequently asked questions are good, but the toughest questions are not frequently asked – and if they are, they are answered in a way that is nearly incomprehensible. If two unmarried people buy a house together, who gets the new $8000 homebuyer credit? You can imagine this question coming up for someone, but not among any list of frequently asked questions. TurboTax answers this very question on their blog, and has many such blog posts aimed at big tax questions like this. Sometimes you need more than 140 characters to explain something well. The TurboTax blog is a great resource that aims to do that. Take all these tools together, and you'll see how TurboTax is taking a nationally reviled day and making it a little bit easier to get through.